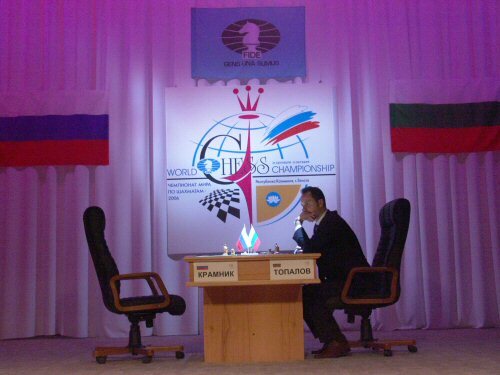 09.29.06 Accusations, counter-accusations, open letters, complaints and demands permeated the atmosphere at the Topalov - Kramnik Match for the World Chess Championship in Elista, Kalmykia. The fifth game was officially forfieted by Kramnik earlier today when he refused to arrive at the board thus allowing his game time to run out. We bring you an update on the series of events that has left this reunification match hanging in the balance. Veselin Topalov waits in vain for his opponent Vladimir Kramnik to arrive for Game 5. Kramnik was subsequently forfieted. Topalov opens with...The Toilet Gambit? On the request of Mr. Topalov the agreed live monitors have been removed as well as the shower cabines in the bath rooms. The moves are provided on demonstration boards only. The substance of Mr. Topalov protests (dated 22, 24 and 28 September 2006) were basically always met by the approval of the Appeals Committee. Everything has been done here to satisfy Mr. Topalov’Äôs requests. The protests of the Topalov team into the direction of Mr. Kramnik and the suspicions in the press release of Mr. Topalov are utterly disgraceful and are touching Mr. Kramnik’Äôs privacy. We do not think that the Topalov team has any right of getting access to the recordings. This shall be job of the nominated arbiters only. 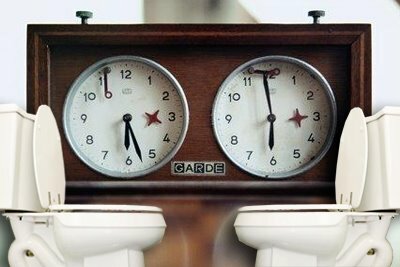 In the meanwhile Mr. Kramnik will stop playing this match as long as FIDE is not ready to respect Mr. Kramnik’Äôs rights, in this case to use the toilet of his own restroom whenever he wishes to do so. I am currently in Sochi, at meeting of meeting of the Heads of the Regions of the South Russian Region of the Russian Federation led by the President of Russia V. Putin. I have carefully read your open letter of today addressed to me, and I hereby inform you of my full trust in the members of the Match Appeals Committee and their latest decision taken in respect of the appeal of Topalov’Äôs team dated 28 September 2006. I am also asking you in good faith to continue your participation in this match for the sake of the principles of our sport and prevention of the destruction of our long-sought efforts to organize this World Championship match, which is of utter importance for the whole world. Millions of chess fans in the whole world are following this match with great interest and are looking forward for the just outcome produced over the chessboard and not from exchanging open letters which we are receiving from both teams. The Republic of Kalmykia and me personally as well as the Russian Chess Federation with its President, Mr. A. Zhukov have done our best in order to secure excellent conditions for the both participants. Therefore, I am kindly asking you to respect all these steps taken towards the smooth organization of the event.